Three acclaimed international eating-out guides give Mayfair's "Spanish Gem" their vote "This casual, crowded Spanish gem is a winner thanks to terrific tapas that won't break the bank, great sangria and smiling waiters who work as a seamless team; and if it would be unremarkable in Andalusia, it hits the spot as far as Londoners are concerned." 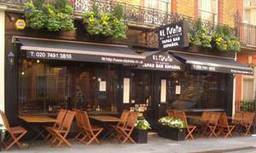 "Surprisingly good prices, for such a posh area make this noisy and busy tapas bar, not far from Hyde Park Corner, an ever-handy stand-by." "Wonderful Spanish staff, a buzzy atmosphere and arguably the best tapas in London combine to make this tucked-away Mayfair haunt the eatery of choice for many local workers. All the favourites are there â€" meatballs, kidneys in sherry, deep-fried squid, paella and tortilla â€" all cooked to order to ensure the results are never less than excellent."